Yes, you read the title right. Spiderman lives under my roof. Well, at least my spiderman. My spiderman is better-looking than Toby Maguire and is a genuine superhero. But the truth is, I get scared everytime I watch him climbing walls or jumping on teeny tiny rocks. My eldest son is a wall climber. At 13, he’s actually short for his age. 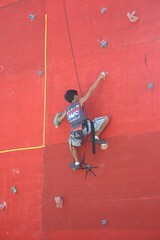 It’s this disadvantage that wows audiences everytime he competes in wall climbing. I do try to look composed and confident everytime he climbs. What he doesn’t know is that I’m a bit scared — not only because he might injure himself but also because he might not make it to the top and get heartbroken. I know this because I see the look on his face when he falls before he completes a climb.